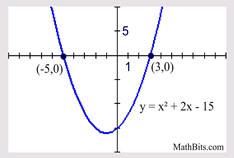 A quadratic equation is a polynomial equation of degree two, which can be written in the form ax2 + bx + c = 0, where x is a variable and a, b and c are constants with a ≠ 0. Why does "quadratic" refer to equations of degree two? While the prefix "quadri" (in Latin) means four, the word "quadrus" means a square (which has four sides). The word "quadratus" means "squared". In early mathematics, quadratic equations were used in connection with geometric problems involving squares. When you find the area of a square, for example, the area is expressed in "square" units (with the units being raised to the second power). Raising to a power of two is referred to as "squaring", and equations with a power of two are called quadratic equations. Solving a quadratic equation can range from being a simple task, to being a challenge. In this quadratic section, we will be building our arsenal of strategies for solving quadratic equations. For more details on the process of factoring, see the Factoring section. The information presented on this page is meant as a refresher of those factoring skills, as they pertain to quadratic equations. Express the equation in the form ax2 + bx + c = 0. Factor the left hand side (if 0 is on the right). Set each of the two factors equal to zero. 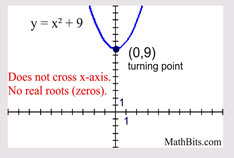 Solve for x to determine the roots (or zeros). Simple quadratic equations with rational roots can be solved by factoring. Let's refresh our memories on factoring these simple quadratic equations as they appear in different situations. Refer to Factoring for more examples. Find the largest value which can be factored from each term on the left side of the quadratic equation. 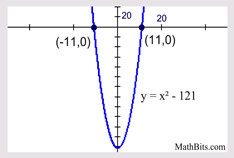 The roots (zeros) correspond to the locations of the x-intercepts of the function y = 4x2 - 28x. 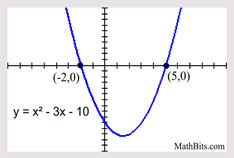 When the leading coefficient is one, the product of the roots will be the constant term, and the sum of the roots will be the coefficient of the middle x-term. Remember the pattern for the difference of two squares, where the factors are identical except for the sign between the terms. Life gets more difficult when the leading coefficient is not one. Check out the Factoring section to see more strategies for factoring these pesky problems. Sometimes you have to "work" on the equation to get the needed quadratic form. In this case, distribute, and the x2 will appear. x2 may appear when cross multiplying ("product of the means equals product of the extremes") is employed in a proportion. Isolate the ax2 term on one side of the equation. 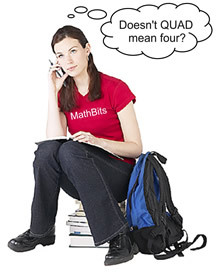 Remember to use ±, as there are two solutions. Express the roots (or zeros). 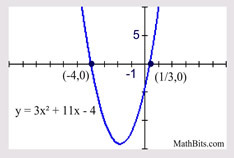 The square root method applies only to a one specific situation. This method works when there is no middle bx-term in the equation. The only variable in the equation is an x2-term. We saw this example under the previous method of factoring. 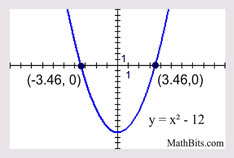 Here it is again, being solved by the square root method. Notice the answers are the same. 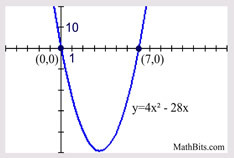 Only variable is the x2 term, with subtraction of constant. 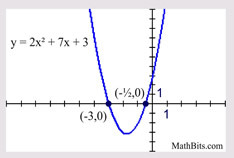 This example shows the numeric value (the constant), subtracted from the x2 term. 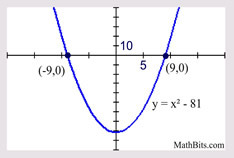 Only variable is the x2 term, with addition of constant. This example shows the numeric value (the constant), added to the x2 term, which creates "complex" answers containing the imaginary "i". completing the square and quadratic formula.